One of my first calls this morning was from our CFO, Greg Curling. "Joan, you told me to call no matter how wacky it seems," he started out. Indeed, I have -- and the same goes to our readers and neighbors. If you see news happening, or have a tip you think might make a good story, you should contact us. Greg's call has turned into an interesting story. He had passed a school bus pulled over on State Road 64, surrounded by police cars. Reporter Robert Napper started making calls, and found out that the driver, on his way to Lakewood Ranch High School with a busload full of students, pulled over after more than a dozen of his young passengers became so unruly that their safety was in question. We'll have more on this story in Thursday's Herald. And if you have news, you can e-mail me, Metro Editor Marc Masferrer, East Manatee Editor Jim Jones, or any of the editors or reporters on staff. Or call our news hotline at 941-745-7000. It's a glorious Sunday here in Manatee County. The morning fog has burned off, the temps are in the low 60s (sorry, all my Northern pals) and coffee is brewing. And I'm going shopping -- definitely not one of my favorite things, honestly, unless I have coupons. So Bealls, with the launch of its spring campaign and special discounts, is my destination. Enough plugs, as I wrote my Sunday column on this today. But it's all about Florida, and it's a pretty darn good place to be today. Sports editor Kamon Simpson and reporter/columnist Roger Mooney live to talk sports, so launching a podcast proved a natural for them. They and the rest of our sports staff -- and probably some of the avid sports lovers throughout the newsroom -- plan to talk all things sports every Wednesday in "Leading Off." In this week's podcast, they expound on the Cardinals and Steelers as they make their way to Tampa for the Super Bowl; the Bucs' surprising announcement on replacing Jon Gruden with Raheem Morris; and the Tampa Bay Rays preparing for spring training in Port Charlotte. A footnote: If you know Jackie Luper, our vice president of interactive media, you know that she talks fast enough to break the sound barrier. So you won't recognize that polished radio voice introducing the first "Leading Off" -- yep, that's Jackie! As millions of people descend on Washington, D.C., for Barack Obama's inauguration Tuesday, we plan to bring you full coverage here at home in Manatee County. Many of our neighbors are among those millions, and we've been talking with them for the past week about their plans and hopes in stories such as Vin Mannix's on Jeanette Kelly, a remarkable humanitarian and retired teacherr. 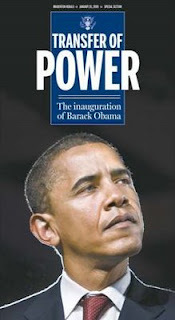 To commemorate this historic event, the Bradenton Herald will include a special section in Tuesday's editions: Transfer of Power: The inauguration of Barack Obama. The section includes an historic look at all U.S. presidential inaugurations; offers a glimpse at this week's pomp and circumstance; captures local leaders' hopes for the future; and walks you through the nation's Capital. Here on Bradenton.com, we will offer you live updates throughout the inaugural ceremonies, with all coverage captured at this link. You also can find McClatchy's Guide to the Inaugural here, with coverage from our Washington bureau and reporters from around the country. And in the Jan. 21 edition, the Herald's keepsake recording that history, we will offer a full-color poster documenting the moment power is transferred and a new era has begun. That will wrap pages packed with events throughout the day. State Rep. Bill Galvano, R-Bradenton, called me this morning about the heat he’s getting over the complaints against House Speaker Ray Sansom. Sansom has been accused of violating ethics rules by taking a $110,000 job at Northwest Florida State College. Galvano says he has two complaints in his possession, including the one referenced by the Times from Susan T. Smith of Odessa. She alleges that Sansom, by taking the Northwest Florida job, violated a House ethics rule. Galvano said he received the complaint on Tuesday, and will be making that decision within 20 days as required. “That makes me tantamount to being a judge,” Galvano said. And as judge, that’s why he hasn’t made public statements about the Sansom case. He can’t until he makes his decision, which will be an official House action. His call was prompted by this letter to the editor today, in which Frank Ward demanded that our local legislative leadership hold Sansom accountable and seek his resignation. The Herald also called for Sansom's ouster in this editorial Jan. 4. If Galvano finds merit in those complaints, the letter writer seems tack on. We’ll be waiting to hear his ruling, following this in the Herald and online in the coming days. Every day, the Bradenton Herald features a Manatee child's drawing for our "weather art" on Page 1A. It's been great fun culling from the creative offerings of our youngsters, who manage to express Florida weather patterns in a million different ways. We get most drawings from classrooms across Manate County. But the feature has prompted many a proud grandparent to submit their pride and joy's fine art. 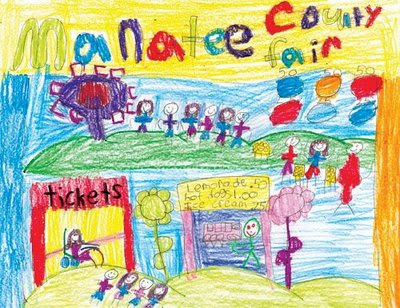 Well, it's time for the Manatee County Fair, and that always means you can count on a change in the weather. So when we published our weather story this week, I asked the editors to consider getting fair-related art for the daily forecast. One of our most reliable sources has been Audre Marans, the art teacher at McNeal Elementary School. Sure enough, one call to Mrs. Marans and we now have dozens of joyful drawings -- more than enough for every day of the fair. I asked Mrs. Marans how she inspired her students. "That was simple -- we had a great discussion knowing that the county fair was about to open," she said. "What will they see if they go to the fair?" OK, I can't wait for opening day tomorrow. Mrs. Marans had one favor: to put in a plug for the survival of arts in the Manatee school system. If you needed proof that the arts should never be optional, keep an eye on our weather forecast. It's a snapshot of a beautiful way for children to express themselves. In my column today, I gave you a glimpse of just a few of the powerful messages conveyed in the 288 essays entered in the annual Dr. Martin Luther King Jr. essay and speech contest held. Reporter Sylvia Lim covered the event last week at the Palmetto Youth Center in this report; winners were selected from 29 finalists. I've been a judge since the contest began nine years ago, and each year participation has grown. But this year, entries almost tripled. Is that indicative of keen interest in change as Obama becomes president? One can only hope. “I have brothers, sisters, nieces, nephews, uncles and cousins, of every race and every hue, scattered across three continents, and for as long as I live, I will never forget that in no other country on Earth is my story even possible,” Obama said. The Bradenton Herald's Nov. 5, 2008, front page will be included in that book, which also will include photos and stories by McClatchy journalists covering the 2008 presidential campaign across the country. If you're a Herald subscriber, you can receive a discount with preorders of “In No Other Country on Earth.” You'll find information on Bradenton.com and here at http://www.obamathebook.com/. Our Washington correspondent, Lesley Clark, sent us an interesting note this morning that's worth sharing. It also prompted us to search for her blog -- and get it reposted on Bradenton.com/news/politics/. We're lucky to share Lesley with the Miami Herald. If you have story ideas or questions for Lesley, please send her a note at lclark@miamiherald.com. Al Franken to follow in Vern Buchanan's footsteps? As the Senate convenes today, one question is whether to seat comedian-turned-politician Al Franken whom a monthslong recount shows eked out a 225-vote victory over Minnesota Sen. Norm Coleman. Coleman is pursuing an appeal and Republicans object to seating Franken until the case is resolved. But a number of pundits suggest there is plenty of precedent for seating Franken -- pointing to Florida's own Rep. Vern Buchanan, who was provisionally seated by House Democrats in January 2007 -- despite a challenge from Democrat Christine Jennings who blamed her narrow loss on malfunctioning election machines and pursued a legal challenge. She lost her appeal -- and a rematch against Buchanan last November. Finally -- a new year. With it brings cautious hope for some overwhelming changes -- for peace, for a stable economy, for health and happiness. Those bold wishes echoed through our local leaders' wishes today in the Bradenton Herald. "My wish is that 2009 brings the turnaround we have all worked so hard for, and that we have fun and many successes in getting there. This past year has been an amazing challenge in so many ways -- and we're still there for each other, through thick and thin. You've accomplished great things -- in print, online and in our community. Here's a toast to each of you, and to the Fourth Estate. The world needs us, more than ever." Here's hoping we all share a good year. A toast to 2009. Happy New Year!